From "I Drink on the Job"
Charlie Adler’s book “I Drink on the Job: A Refreshing Perspective on Wine” is part story, part education and full of anecdotes from his twelve years teaching over 16,000 people the basics of wine. 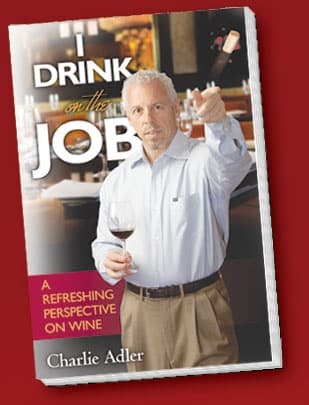 “I Drink on the Job” is based on Charlie’s highly rated wine class “Wine Basics 101″…Rather than write a book that covers every detail of wine, he focuses on the real questions from people attending TasteDC’s class who are hoping for easy answers. Charlie’s conclusion is amazingly simple: wine is meant to be enjoyed with food. Pop the cork, screw the screwtop, drizzle the bag-in-the-box wine – wine should be an everyday pleasure served with meals! After twelve years and over 1,000 wine tastings, 200 cooking classes and a myriad of food and wine events, Charlie knows that American’s are catching on quickly – and they definitely have the wine bug! Each chapter shines new light on what it’s like to be a wine professional in the nation’s capital. Whether it’s a wine tasting at a foreign embassy, a unique ethnic cooking class in Little Ethiopia or a wine making class in Virginia’s wine country, Charlie shares his passion for wine and food with a wide range of people. Copyright © 2010 I Drink on the Job. All Rights Reserved.